The Raid Pyrénéen is organised by the Cyclo-Club de Bearn in the heart of the Pyrénées. The challenge is to ride from the Atlantic to the Mediterranean over 18 classified cols in only 100 hours including sleep! A carnet de route is provided, and when returned to the Cyclo-Club with all control stamps present and correct, a prestigious medal is awarded. Not for the faint-hearted or under-prepared, the Raid is one of the toughest, but also one of the most rewarding, things you will ever do on a bicycle. We collect from Biarritz airport (direct flights from Paris, London Stansted and Dublin) and Biarritz TGV station (direct trains from both Paris centre and Charles de Gaulle airport) and whisk you the short distance along the Atlantic coast to our hotel in St Jean de Luz. A leg loosening ride along the Corniche Basque will sharpen our appetites for a splendid dinner at the hotel. With the first stamp (from the hotel) in our Carnets de Route, we roll down to the coast to make sure we’re going all the way from the Atlantic to the Mediterranean, and we’re off! 100 hours to get to the Mediterranean, 710 km and 18 cols to cover! Luckily, the first day is a relatively gentle introduction. Into the foothills we soak up the Cols de St-Ignace (169m) and de Pinodiéta (176m) before the second control at Espelette, famed for its red peppers. No let up through the gently rising terrain, we have the Col d’Osquich (392m) before arriving at our stop for the night in Lurbe St Christau. An early start today as we tackle four of the legendary cols on the route. First of all is the Col de Marie Blanque, last in the Tour in 2010 when Juan Antonio Flecha was first over. 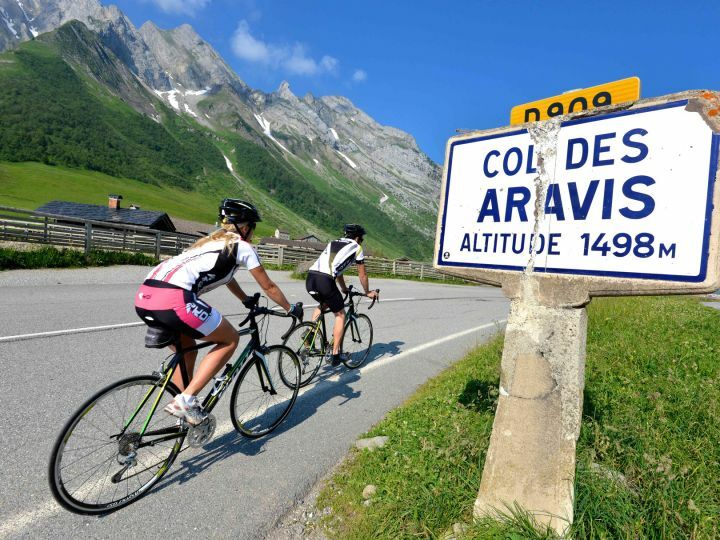 Next up we have the double-header of the Col d’Aubisque (1709m) and Col du Soulor (1479m), although it could be said that doing one from the other doesn’t strictly count! 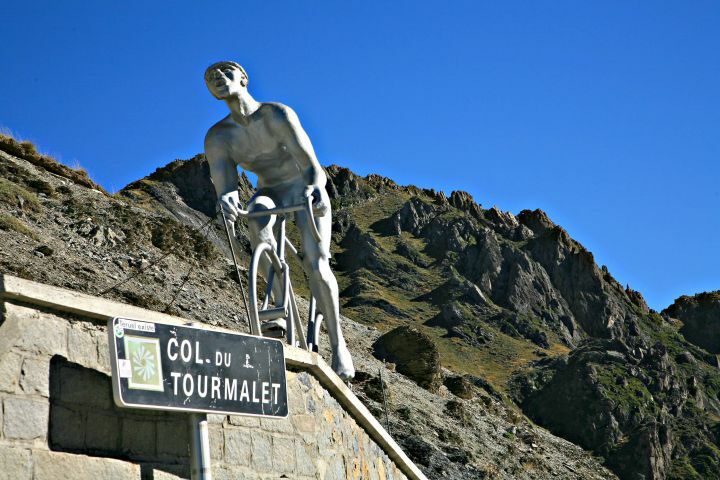 We descend to Argelès-Gazost before the long drag up the valley of the Luz that marks the start of the awesome Col du Tourmalet (2115m). This is real test of the cycling legs and the source of many Tour legends, from Octave Lapize’s cry of ‘Assassins!’ in 1910 to Eugène Christophe, who in 1913 broke and mended his forks but was penalised for having the blacksmith’s boy work the bellows. Our hotel is a lovely family-run maison in the village of Gripp on the descent from the Tourmalet. Rolling down through Sainte-Marie-de-Campan, scene of the Christophe/blacksmith incident, we tackle the Col d’Aspin (1489m) and descend into Arreau. From Arreau, the beautiful ascent of the Col de Peyresourde (1569m) awaits before a pair of relatively short but tough cols: the Col Des Ares (792m), and Col de Portet D’Aspet (1069m). On the ascent of the Portet d’Aspet, stop at the Fabio Casartelli memorial where the young Italian tragically lost his life in 1995. Tonight’s hotel is situated in the town of Saint Girons. Today is the biggest day of riding and will test endurance to the limit! From Saint Girons, we climb the Col de Port (1249m), whose name means ‘Pass Pass’ in French and Occitan, we ride through Tarascon and the spa town of Ax-les-Thermes, and then climb the Col de Pailhères (2001m), which will be featuring in the 2013 edition of the Tour. There is one more substantial col to tackle in the shape of the Col de Jau (1506m), an old ski resort with only one lift and two blue runs. From here it’s downhill all the way to Prades and our hotel for the night. Nearly there! An early start from Prades, to make sure we come in under 100 hours, takes us past the huge Vinca reservoir and sees us conquer the last two more modest cols, the Col St-Pierre (231m) and the Col de la Ternère (233m) in quick succession. Then we fly all the way down to the sea at Banyuls before our final run in along the coast to Cerbère and the warm waters of the Mediterranean. The Raid is completed - Chapeau! Reward yourself with an afternoon on the beach, or maybe go back to Banyuls for a winetasting. Dinner tonight (quite possibly delicious fresh seafood) can be rather more indulgent and a celebratory glass or two won’t go amiss. After breakfast we say our farewells to new-found companions of the road. We transfer to Perpignan airport for flights to London, Birmingham (UK) and Southampton, and to Narbonne TGV for direct travel to Paris and beyond.